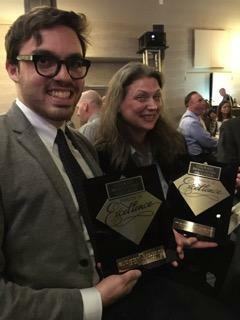 91.5 KRCC took first place in the category “Best News Coverage of a Single Event” with its coverage of the Colorado Springs/Broadmoor land exchange, which we call “The Case of Strawberry Fields." - this includes feature reporting from Jake Brownell, a special Wish We Were Here episode, produced by Jake Brownell and Noel Black, and including work from student reporters Holly Pretsky, Tucker Hampson, and Dana Cronin, among other pieces. 91.5 KRCC also took first place in the pubic radio specific category of “Best Mini-Documentary or Series” for Wish We Were Here, Episode 12: Avalanche on America’s Mountain. Update: On 3/17/17 we removed the first sentence of this post congratulating only Andrea and Jake; there were others that worked on these stories as well.